The aliens have come to earth and do not come precisely in peace. They are willing to take the place and kill all the humans who stand in their way. We will be part of the army in charge of stopping the advance of the aliens and we must do well if we want to survive. You will start with a single soldier and you will have to survive with the help of a submachine gun. 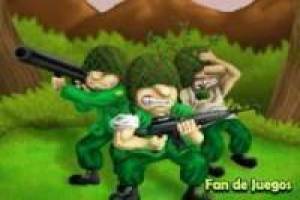 As you defeat enemies, you will get coins, which you can exchange for more soldiers. The price of these soldiers will depend on the power of the weapon that accompanies them. You can get a bomber, a soldier with RPG and others much better equipped to stop the extraterrestrial advance. Enjoy the game Extraterrestrial Command, it's free, it's one of our war games we've selected.